Courtesy photo Raul Midón will perform at the Sun Valley Opera House on Friday, Dec. 3. Blending world music styles with a rock-inspired performance is what makes Raul Midón a must-see show. Midón is a excellent guitarist, singer, songwriter and cultural messenger who will play on Friday, Dec. 3, at the Sun Valley Opera House as part of the Sun Valley Center for the Arts' Lecture and Performing Arts Series. Tickets are $20 for Center members and $30 for nonmembers. "I don't know what else I would do," Midón said when explaining his love for music and performing. "It's a passion, and I love doing it." The son of an Argentinean father and an African-American mother, Midón was born prematurely in a rural hospital in New Mexico, where he and his twin brother, Marco, were blinded as infants after spending time in an incubator without adequate eye protection. Midón's brother works for NASA as an electrical engineer, while Midón followed a musical path inspired by his father, a professional Argentine folkloric dancer. "Most of what I do is my own material," Midón said. "I am completely blind so very early in my life options were limited as far as what I was going to do." Midón said a company called Dancing Dots creates software for the blind to use, which has added producing to his list of accomplishments in music. He is a compelling "triple threat" as a show-stopping guitarist, powerful pop, soul and jazz vocalist and outspoken songwriting talent. The New York Times praised him as a "supple, high-flying tenor" and wrote that his live performance was "a force of nature." "There's always a part of my performance that is in the spirit of the moment and that is the jazz element of what I do," Midón said. "There's always something different in what I choose to do in any given song." Midón studied jazz at the University of Miami and became a backup singer, working primarily in the Latin-pop world for such artists as Julio and Enrique Iglesias, Shakira, Ricky Martin and Alejandro Sanz. 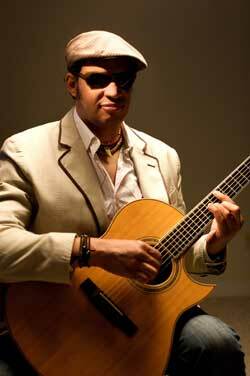 He has collaborated with musical legends Herbie Hancock and Stevie Wonder and has toured extensively throughout the U.S., Europe and Japan. Midón made his network television debut on "The Late Show With David Letterman" in 2006 and today plays to sellout crowds around the globe. A clip of him singing his song "State of Mind" still gets a great deal of play on YouTube. Midón has released three solo albums "State of Mind" (2005), "A World Within a World" (2007) and "Synthesis" (2009). Legendary producer and bassist Larry Klein, who is noted for his work with such luminaries as Joni Mitchell, Herbie Hancock and Peter Gabriel, produced "Synthesis." The album features 11 new songs, including 10 Midón originals and a stunning cover of The Beatles' "Blackbird." Soultracks calls it "clearly his finest [album] ... the most melodic, accessible music he has ever recorded."